Curiosity woke up to Mr Rogers' "Please would you be my neighbour" this morning to welcome InSight, and then got busy at the Highfield drill site. Curiosity will dump the Highfield sample, which requires several MAHLI looks and an APXS operation, but the plan also requires swinging the arm out of the way so other instruments can have their unobscured look at the dump pile. 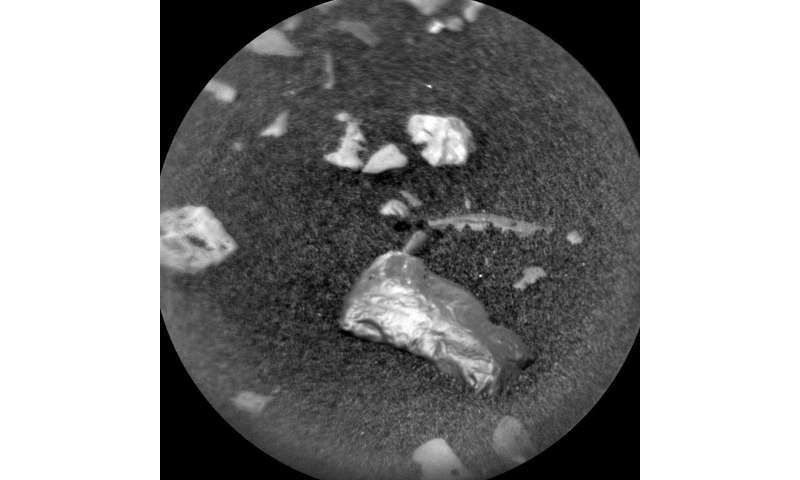 The ChemCam is also very these two sols. In addition to the dump pile activities, it will look at four samples, two of which are re-targeted. One of the samples is "Little Colonsay." The planning team thinks it might be a meteorite because it is so shiny. But looks can deceive, and proof will only come from the chemistry. Unfortunately, the small target was missed in the previous attempt, and with the information from that attempt, Curiosity will try again. Another very small target is the target "Flanders Moss," which shows an interesting, dark-coloured coating. Chemical analysis is required to confirm its nature. Two additional targets, "Forres" and "Eildon," are to add to the database of the grey Jura bedrock before Curiosity leaves the Highfield site next week. Beyond ChemCam, Curiosity will document the workspace with a Mastcam M34 mosaic, and of course document all ChemCam targets. Finally, the environmental observations continue with a crater rim extinction, Mastcam Tau and dust devil monitoring—a busy two sols on Mars. Looks like a nugget of pure Californium 252 to me. Huh... And here I figured it for a cubit of unobtainium 69. What a waste of money. If we could spend it on getting out there instead, they could HOLD the darn thing and test it up close. ... comment. The science will be done (or not). Meanwhile, put up your own lander, then come back and comment on lost money. Oh, JamminG. I'd bet you believe the funding for these projects get stuffed into the launch rockets. To be burned up as propellant during blast-off? Actually, if that was true? A lot of economists would rejoice watching all that excess waste paper burn! Instead, Space funding is carefully dispersed to industries & academic institutions in communities across the USA. Partly to protect against loss of skilled workers at critical facilities & research centers with their experts. In the Atomic Age, dispersal is survival. Though MOSTLY to spread the money among enough Congresscritters. Keeping them happy at reelection time & thereby encouraging their continuing support of the US Space Program. What? You thought they were doing this out of some sort of fevered devotion to Public Service & the Betterment of Mankind supporting Scientific Progress? Hahaha! Now pull the other one! As for this particular rock? Shiny! Our monkey brains can't resist picking it up. so torbjorn what is your evidence that the object is not a nugget of pure Californium 252? Granted i have never seen a nugget of pure Californium 252, but a tentative discovery of a nugget of pure Californium 252 on mars would be a good reason to go there, nicht wahr? "$27 million dollars per gram"
...I stand by my initial assessment. My evidence is the half-life of 2.6 years. In the time it took me to post this, it is impossible for it to still be 'pure' Cf-252. "Oh, wait?" Squint closer. "Damn! It's a nickel a dozen of pyrite." Casually toss it away. Then point in the opposite direction. "Look! What's that over that away?" "Oohh, it's so shiny! We gotta go get that one. Whatever it is..."
Good enough to attract our Simian forebears a million years ago? Good enough reason to attract our devotion... I mean attention! Yes, yes I do. Wow a natural Cf-252 synthesizer and a potential fusion catalyzer. Even more reason to go there. All we need to find is a muon source.